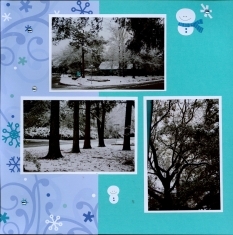 A Record Snowfall in Charleston, SC prompted the layouts for the Winter Snow Scrapbook. A good way to remember February 14, 2010. For us it was only about 4 inches, but it was the 6th on record for the area. The last time we really saw snow was December 1989, so for some of us it was a day to behold. We heard later in the day that 49 of the United States had snow, and the following day we heard that even Hawaii had snow atop Hawaii's 13,800-foot Mauna Kea volcano. According to Yahoo News! The idea of 50 states with snow is so strange that the federal office that collects weather statistics doesn't keep track of that number and can't say whether it has ever happened. The office can't even say whether 49 out of 50 has ever taken place before. 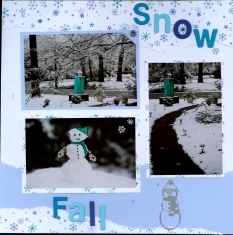 Many of us may now have photos for a Winter Snow Scrapbook that we have not had an opportunity for in many years. All of these photos were developed by Kodak Gallery using their Professional Metallic finish. This process gives the photos a distinctive Metallic Pearlescent finish with intense blacks and vibrant colors, and exceptional sharpness. While these are not black and white photos, the contract of the snow and the trees was particularly stunning. The white of the snow combined with the metallic finish, gives the snow almost a mirror like appearance in real life. 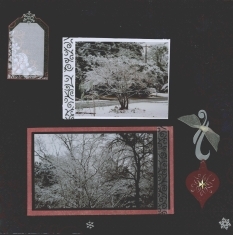 These Winter Snow Scrapbook layouts had been done a few months earlier without photos and were intended to be used for our Christmas holiday photos, but the Snowfall photos took over. I like to do layouts without the photos and then add photos later. Oftentimes this means re-arranging the layouts a little to accommodate the orientation of the photos. I use only a little adhesive when I first put the layouts together so I can move photos mattes or embellishments. Sometimes I add things to the layout when I add the photos. 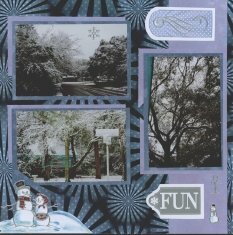 Above I used the Chipboard Alphabets by K & Company (recycled) to add the title Record Snow Fall. 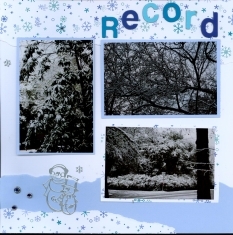 Back to discussion on the photos with these Winter Snow Scrapbook layouts. 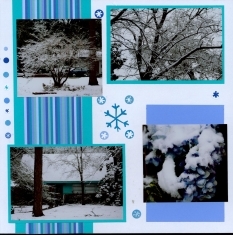 The Teal color of the house and lamp post shows as the only color item in many of these photos, so I picked the layouts with the teal color as part of the background to tie them in. 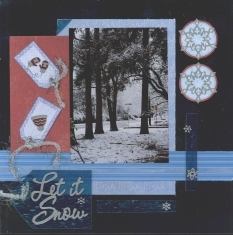 The papers and embellishments used in the 4 sets of Winter Snow Scrapbook layouts above were all from a kit by Doodlebug Designs, Inc. 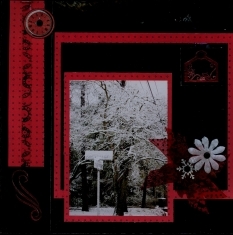 Above, these Wintertime Scrapbook Layouts feature two 5 x 7 photos which show noting but black and white snow covered trees and fit nicely on the Black and Silver Foil board accented with Red matting with Red & Silver embellishments of flowers, brads, dazzles (some silver and some inked with Red metallic pen), cutouts and ribbon - all of which came in the monthly kit. Unfortunately the beautiful Foil Board of Black with Silver Metallic Floral does not show well in the scan. 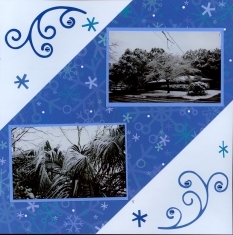 These 2 Snowfall Scrapbook Layouts use 2 more 5 x 7 photos with light blue and white paper that reads "Let it Snow" plus some blue striped paper ribbons and red mattes on a beautiful Foil Board that is Silver with very intricate Blue Snowflakes. Again, the beautiful design on the Foil Board does not scan well. The embellishments include accents of Blue Joilte, a pliable plastic that is clear and textured and looks a lot lite a piece of stained glass. 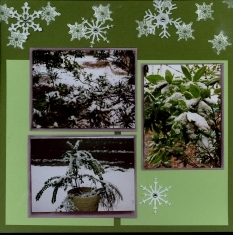 Also used on the left are Silver Dazzles, for the "Let it Snow" Tag, Silver Snowflake Dazzles scattered on the pages and on the various tags tied with Silver Mesh Ribbon. On the right page is a Gold Border Dazzle. 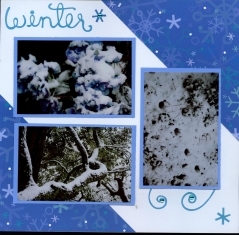 All the items used here came with the December 2009 Winter Kit from Paper Wishes Personal Shopper. 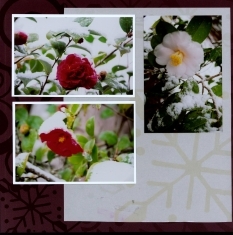 These two Winter Snow Scrapbook Layouts are on a Foil Board background that is basically black with Black, Red & Silver Floral corner designs. 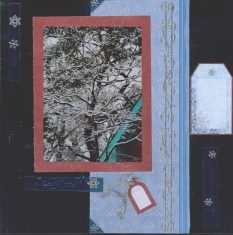 Each of the photos are double matted on either Red and Black cardstock or single matted on white cardstock, each trimmed with Organza Ribbon with a black swirl design. Tags use Silver Dazzles, White Organza Ribbon, and Red Felt Ornament shapes with Gold Star Brads in the center. 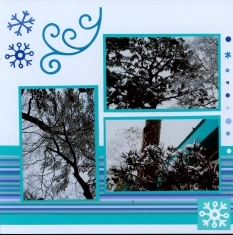 These Wintertime Scrapbook Layouts use a beautiful Light Blue Foilboard, Lavender and Blue Star paper for mattes and lots of Silver Winter Dazzles for tags and to set the Winter Snow scene. 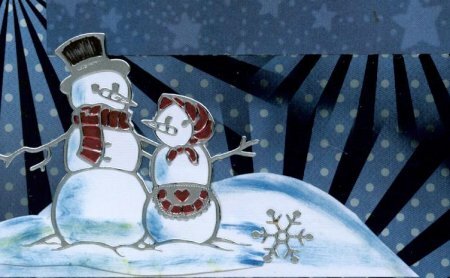 The Silver Dazzles depicting the Snow People and The tree, were stuck to white card stock. The cardstock was trimmed around the edges of the Dazzles. Then the paper behind the Dazzles was colored in with a Black Pen, Red pen or chalked to create the detail in the scenes. 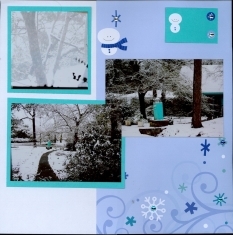 Another pair of beautiful Snow Winter Scrapbook Layouts using a Teal Blue Foil Board with Blue Cardstock matting. 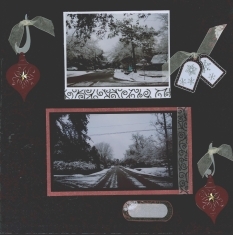 Lot's of embellishments here with the Gold Dazzles as accents on the page corners, to accent the journaling block, and as border accents on the photos and a bracket on the side of one photo. 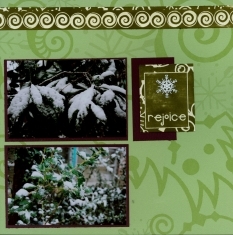 Also used on the Winter Snow Scrapbook layout were snowflakes cut from a dotted vellum using two separate designs from the Snowflakes & Stars Template from Paper Wishes.com that came with their November 2009 Personal Shopper kit. 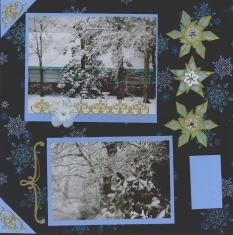 The folded snowflakes were accented with a Gold Metallic marker, Gold Star Brads, and White Showflake Brads, all of which came with the kit. 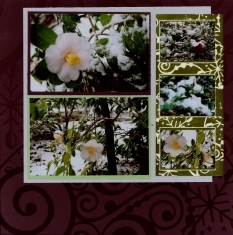 For a different Snow Winter Scrapbook idea, I took some photos of the Red & White Camellias that were blooming at the time along with the Green Holly - all with snow. Not something we usually see around Charleston! 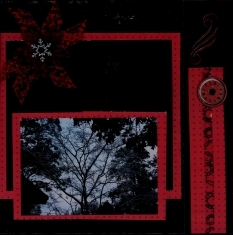 For these layouts I used some of the papers from the Club Scrap Special Release Kit in December 2009. This kit was designed with images from some of Michael Strong's Cloisonne Rubber Stamps. The papers of Dark Reds, Greens and White were embossed with the same images from the Stamps. I thought they went well with the colors in the photos. 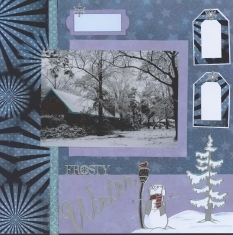 These last Winter Snow Scrapbook layouts below use more of the greens from the Club Scrap Joyful kit, along with snowflake's stamped in White in addition to White Felt Snowflakes attached with Silver Brads. The Green and White strip across the top of the right page is a strip of the White on White embossed that was inked in Dark Green. After inking, the embossing had the ink removed with a tissue leaving the white embossing clearly visible. Check out our other Themed Books for many more Scrapbook Layouts Ideas.